Strengths: Aganos forces opponents to play differently against him than any other character in the game, and any failure to adjust will result in swift victory for Aganos. He is a surprisingly competent zoner and terrifying up close when he has access to Payload Chunks, which give him hits of armor to absorb and punish in situations where other characters are left helpless. He also has the largest throw range in the game, giving him meaningful mixups at ranges most characters can't easily handle. If left to his own devices, he will use his chunks to set up walls, and use shadow Ruin to turn any jump or poorly placed attack into 50% unbreakable damage on reaction from nearly anywhere on the screen. Weaknesses: Aganos's enormous size comes with the natural drawbacks of poor walking and jumping mobility and a large hitbox which puts him in harm's way of ambiguous crossups, making defensive play challenging. In particular, if the opponent can strip Aganos of his armor, he is left with perhaps the worst defense in the game. His slow normals and lack of meaningful coverage around his head make it very difficult to swat annoying jumping opponents out of his space. This is made worse by his poor defense to throws; jumping to bait throws is common in KI, which makes it especially challenging for Aganos to stop repeated throw/jump mixups. Notes: Being slow and lumbering, it's expected that his counter breaker combos are fairly simple. It's a big cost, but if you're willing to forgo about 10-12% damage, you can end each combo with the Payload Assault ender to chunk back up, which may be preferable depending on the state of the match. Natural Disaster linkers are slightly less damaging than Pulverize linkers, but they are preferred for the corner carry. Shadow Pulverize does massive damage compared to shadow Natural Disaster, but shadow Natural Disaster has excellent corner carry, which is where Aganos really shines. For example, in the two-meter combo, you can do a HK double first, then replace the first (not the second) shadow Pulverize with shadow Natural Disaster. You'll do 2% less damage but likely put your opponent in the corner and end up dealing much more damage in the long run. Aganos's immense size isn't his only unique attribute. Aganos can store up to four Payload Chunks in his body, as signified by a special meter above his shadow gauge. He starts every match with two chunks, and there are only two ways to refill your chunks in the middle of a match. Firstly, the Fortify Chunk command normal ( + HP) causes Aganos to scoop a rock off the ground and stuff it in his chest. This move has fairly long startup, so you can only use it when your opponent is not pressuring you, or after certain types of hard knockdowns (such as crouching HK and forward throw). If Aganos is holding a Peacemaker club, he will stuff the club into his chest to gain a chunk instead, which is considerably faster than the normal way. Secondly, ending a combo with his Payload Assault ender gives him a chunk for each ender level. This is a common way to refill chunks, as Aganos can choose to turn any successful hit into chunk regeneration. Aganos becomes progressively slower with each chunk he is storing. His normal and special attacks have longer startup and more recovery, his walk speed slows to a crawl, and his jump is less floaty. Like other characters with unique resources in this game, there are multiple, game-changing ways for Aganos to spend his chunks. Perhaps the most important use is for grounded armor; each chunk can be used to absorb an enemy hitAganos' armor will not work if he is in the air or in pre-jump frames. Also, Aganos' chunks can never be used as armor under any circumstances in the Aganos mirror match., take the damage, but avoid hitstun and instead give Aganos opportunity to attack himself. 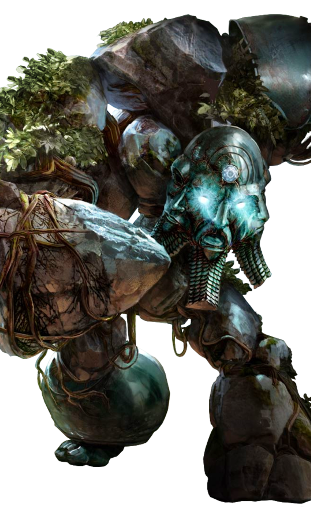 Like all armor in Killer Instinct, it does not proect Aganos from grounded heavy normals. Aganos will have to take care against characters with strong heavy attacks and block or whiff punish as if he didn't have armor. Armor also doesn't protect Aganos from throws, which weakens Aganos's throw defense. But armor works against all jumping attacks, light and medium normals, and all non-throw special moves, which gives Aganos the ability to challenge and lockdown opponents in ways other characters can't. To challenge the armor, you will have to throw him or press a slower, more committal heavy normal, which might not be easy to do in many situations. Aganos can also use the Payload Assault special move to fire a chunk from his chest as a projectile. The light version is a low hit that travels along the ground, the medium version fires at an arcing trajectory, while the heavy version gets sent off like shotgun shrapnel, doing immense chip and close-range damage. All Payload Assaults have fast recovery and double-digit advantage on block, which can let Aganos safely re-chunk using Fortify Chunk from full screen, or augment his pressure and chip damage game. The most interesting use of his chunks is to summon walls, either behind his opponent (PPP) or behind himself ( + PPP). Aganos can spend one chunk to summon a wall in one of these two locations; if he is holding a Peacemaker club, he will instead consume the club to place the wall, and it will take considerably less time. If there is already a wall where Aganos is trying to place one, he will replace it, and he can have up to four walls on screen at any time. These walls are new stage boundaries, meaning they cannot be jumped over and characters with wall jumps or wall splat moves can use the walls as they would a normal stage boundary. Every time Aganos is knocked down or a wall splat is performed, the walls will take damage up to a maximum of 3 hit points, where they will crumble and disappear. To create a Peacemaker club, Aganos can pick up a wall that is directly behind him ( + PPP) and start swinging away to his heart's content. It can be used for incredibly long-range normal attacks and as an unstoppable, instantly full screen projectile. But because walls can become Peacemakers, and Peacemakers can be turned into walls, Aganos can recycle his walls and clubs into each other. Don't like a placement of a wall? Pick it up, turn it into a club, take a few swings, then place it somewhere else (or store it as a chunk). Have too many chunks? Place a wall behind you, then pick it up and store it back in your chest later. Because using the Peacemaker to create walls or store chunks is much faster than doing it without, Aganos can be quite dynamic and move his resources around. The placement of his walls leads to many interesting strategic choices. Aganos can limit his opponent's runaway options by simply placing a wall behind them, or if he has his opponent cornered, he can put a wall behind himself to make the stage impossibly small. If Aganos has remaining chunks to use as armor, he can bully the opponent in a stage size of his choice, leading to very strong pressure. But most importantly, once a wall has been placed, Aganos can wall crash the opponent through them by using his Ruin or shadow Ruin special moves (while holding a Peacemaker, forward throw becomes an untechable grab and will also wall crash). Each wall that an opponent crashes through adds around 20% unbreakable damage to the combo, which means even placing two walls behind an opponent and landing a wall crash can lead to over 50% damage for one move. Because Aganos can absorb hits while using Ruin using his chunks (shadow Ruin has infinite armor without using any chunks), it means Aganos players with good reactions can use the Ruin variations as strict counters to jumps and all mid-range projectiles or pokes for incredibly high damage. Letting Aganos stay full screen away and place walls and repeatedly chunk up will be a nightmare for approaching characters, who have to accept that Aganos will place multiple walls behind them as they move forward, and then they still must content with an armored Aganos when they get close. The animation for placing a wall also has very little recovery, which means Aganos can place a wall and often strictly punish an opponent on reaction who tries to perform any action. Aganos's chunk system is extremely interesting due to the numerous strategic implications. Due to his poor defense when left without armor, Aganos players will often save their chunks as a failsafe for armor on defense and forgo the walls or projectiles. In some matchups, this is often the correct choice, while in others, the armor is less useful and spending chunks as projectiles or placing threatening walls will force your opponent into making poor mistakes. Once Aganos has spent all his chunks, there is no way for him to generate more without finding time for a Fortify Chunk command normal or landing a hit on the opponent, which makes this resource incredibly precious, but incredibly game-changing. Aganos's openers are quite simple. The most common one is Pulverize, which causes Aganos to unhinge the top half of his body and spin around for 3 hits. Like all of Aganos's moves, this move has slower startup and more recovery as Aganos has more chunks. Without chunks, the light version is around -1 on block, making it truly safe, although it can be shadow countered. If Aganos has 3 or more chunks, the move is quite unsafe (-12 or so), but punishing it is challenging as you'll have to fight through Aganos's armor, and he might just perform it a second time to hit your punish attempt. Shadow Pulverize is an important move because it is throw invincible, making it Aganos's only way to directly challenge a throw attempt. Aganos rolls across the stage during Natural Disaster, and can hit up at any point to leap off the ground, which will hit overhead on the way down. This can also function as a tricky crossup if you hit on the back of your opponent's head, but it is risky to attempt because Natural Disaster is always horribly unsafe on block, and if your opponent starts his punish with a heavy grounded normal, armor won't save you. MP Natural Disaster coupled with pressing up shortly after startup has full screen coverage, which is particularly useful to punish long range zoning attacks like Glacius' Shatter or Kan-Ra's Antlion. Shadow Natural Disaster can be held in place, and is fully projectile invincible and quite low to the ground during the hold. It will recapture on the 5th hit, making it a great reaction anti-air to neutral jumps even if your opponent can throw an air projectile. Aganos is massively advantaged on hit if a Payload Assault projectile hits his opponent, so if you're within range, timing any manual after will be very easy. Aganos doesn't always spend his chunks on close-range Payload Assaults, though, so this is not a particularly common technique for him. He also has two normals that cause wall splat automatically, which make them very useful when you are pressuring a character against one of Aganos's walls. You can bait throw attempts and use the far range on neutral jumping HK to start easy combos. Relinquish is the name for Aganos tossing the Peacemaker. Even if you throw it from about three-quarters screen away, on reaction to the stagger hit, Aganos will have enough time to combo shadow Natural Disaster, which makes thrown Peacemakers dangerous. Again, Aganos's linkers are quite simple. Both Pulverize and Natural Disaster actually do similar damage and take similar amounts of time, so they are fairly interchangeable as far as linkers go. Pulverize keeps your opponent in place, though, while Natural Disaster will quickly push your opponent towards the corner; depending on where your walls are located, each linker will have its purpose. Shadow Natural Disaster causes a ton of corner push and is fast, while shadow Pulverize does a lot more damage and is slow, so if you are looking to spend meter in the middle of a combo, you will have to pick the linker that matches the situation at hand. As an added bonus, it is extremely easy to link a heavy manual after shadow Natural Disaster. The main noteworthy thing about Aganos's shadow linkers is that both of them have very fast shadow freezes, so you have to be prepared to break quickly. Shadow Pulverize comes with an oddly staggered rhythm, but in practice it shouldn't affect your timing enough to cause too many lockouts. Shadow Natural Disaster's timing to break is about as consistent as it gets in Killer Instinct; even the gap after the freeze is the same as the gap between each hit. As is the case with many of these evenly-spaced but non-rapid-fire linkers, waiting for the last three hits gives you ample time to align yourself with the rhythm of the first two hits and break with more consistency, as long as your opponent does not predict this behavior and counter break. Aganos has a few important enders. Perhaps the most important one is Payload Assault, which does very poor damage but gives him much needed chunks and continues the close range threat. The Payload Assault ender also gives Aganos time to perform a meaty (armored) attack such as Pulverize, or even set up a wall before the opponent can recover, making it a good all-purpose ender. If Aganos is very close to an existing wall at the end of his combo, the Payload Assault ender animation will cause that wall to crumble. If you are content with your chunks or are looking to maximize your damage, Ruin will wall crash through any nearby walls, but will not allow Aganos to easily pressure or set up after it completes; performing the Ruin ender with no chunks should probably only be done if it will close out a round, or you have multiple walls behind your opponent. You can still wall crash using a Ruin or shadow Ruin in the neutral game later, and you'll be in a better position long-term by using Payload Assault instead. Without walls, Aganos's most damaging enders are Natural Diasaster and Pulverize. Of these two, Pulverize is probably preferred much of the time, because it gives a hard knockdown and keeps the opponent close to Aganos, allowing for enough time to place a wall and perform a meaty attack. Aganos tends to not use his recapture moves in the middle of combos, like many other characters do, due to his relatively limited juggle potential. Instead, shadow Natural Disaster is very effective as an anti-air, which will recapture and start a grounded combo. The one meter cost is expensive, but especially worth it for Aganos, who struggles with anti-air above his head and can use the recapture to perform a combo which finishes in Payload Assault, earning him some chunks back. Jumping HP while holding the Peacemaker also recaptures, which makes it a great button for Aganos to swing with while he is jumping forward from about half screen away. If the opponent jumps trying to gain space back, Aganos will clip him and can start a combo. Aganos' instinct mode gives him unlimited Peacemaker clubs, which respawn directly in his hand about 1.5 second after being used. The club gives him access to new attacks using punch normals (standing HP is a full-screen overhead, crouching HP is a full-screen low, and jumping HP will recapture the opponent) and turns his forward throw into an untechable grab that wall crashes. It also lets him throw the Peacemaker as a projectile, which travels full screen in nearly an instant, is almost impossible to avoid by jumping or low-profiling, and crushes all projectiles along the way, including 5-hit shadow projectiles like Jago's shadow Endokuken. Because Peacemakers also speed up Aganos's chunk and wall placement game, his instinct gives him new options to use his resource. If Aganos is full screen and holding a Peacemaker, he could throw it, use it to chunk up quickly, or place a wall somewhere on screen quickly, and then wait for a new Peacemaker and repeat. Because of this long range threat, you will have to interrupt Aganos from doing this, which puts you in range of his massive Peacemaker normals. Despite this, his instinct mode does not automatically regenerate any of his chunks; he will have to wait for a Peacemaker spawn and still perform Fortify Chunk. This means if you are caught in a poor defensive position, activating instinct is unlikely to let you get out of jail for free easily, and his Peacemaker is not a particularly effective close range tool. If activated at full screen, however, most opponents will have no choice but to take some form of damage as they try to stop Aganos from intermittently chunking up or placing walls. Aganos' normals are often slow and lumbering, but he has a few real stars in his arsenal. Both standing and crouching LP will "flick" projectiles out of the way, destroying them entirely. Blocking projectiles will give you (and your opponent) meter, which is useful for Aganos because of shadow Ruin, but often flicking single projectiles will leave Aganos enough time to quickly store one chunk before the next projectile can reach him. +LP is an anti-air flick, which also destroys projectiles and covers a much-needed area around Aganos's head. Anti-air flick is fast at 6 frames, and is Aganos's primary normal anti-air; crouching HP works as well, but is slow and needs to be used extremely early to be effective. Standing LK is Aganos' only 5 frame normal, which makes it his go-to normal for chunkless punishes on many marginally unsafe moves (like TJ's Tremor). Like all of Aganos's normals, however, it becomes slower when he has chunks. Standing MP is a giant backhanded slap which takes up a lot of important space mid-screen, and standing HK is a bit slower but extends even farther, and is one of the few moves that can combo into shadow Payload Assault. Aganos's close MP is a lightning fast overhead that can be canceled into safe on block special moves like Pulverize or light Payload Assault. Crouching HK is perhaps his best normal; the shockwave from the stomp is a low hit which reaches deceptively far, rivaling Glacius's Ice Lance for range, the move comes out incredibly fast if done without chunks, and it leads to a hard knockdown which can sometimes buy Aganos enough time to swipe a chunk. As far as air normals go, jumping MK is a decent crossup, while jumping HP is slow, but takes up a ton of screen space and can be used in "instant overhead" situations, making it a great air normal to pre-emptively throw out when Aganos is trying to jump in. It also causes a soft knockdown; if your opponent does not quick rise after being hit, use the opportunity to chunk up. Pulverize, Natural Disaster, and Payload Assault have already been discussed in the Unique Mechanics and Openers sections, but Ruin deserves more discussion. As mentioned before, both Ruin and Shadow Ruin can wall crash through any walls that have been set up behind the opponent, leading to about 20% unbreakable damage per wall that is destroyed. Ruin by itself is serviceable for blowing through predictable hits, as long as you have armor, but most of the time you will want to use the shadow version. Shadow Ruin has infinite armor, independent of Aganos' chunks, and has some startup strike invincibility as well to give Aganos a way to beat meaty heavy attacks that would destroy the armor. It is also fully projectile invincible and travels quite fast across the screen. Putting this all together means that shadow Ruin counters pretty much all non-throw attacks in the game, and is especially adept at punishing jumping attacks, projectile attacks, and multi-hitting special moves. If you try to use Shadow Ruin as a reversal attack, be careful of throws, which will always win outright, or neutral jumps, since shadow Ruin will often go under them. On block, both Ruin and shadow Ruin are the most unsafe moves in the game at around -80, giving opponents their choice of punish. Because Aganos does not recover for a long time, the opponent can pick a series of fast multi-hitting moves to strip any and all of Aganos' chunk armor away, leaving Aganos punished and without armor going forward, which can often cost him the entire round. As a result, Ruin is much better to use on reaction than on prediction. Shadow Payload Assault has high startup, but if Aganos is able to slam his fists on the ground, he triggers an avalance of rocks from the sky that fills the entire screen with unavoidable projectiles a brief moment later. The rocks are guaranteed to come down if Aganos can get through the initial startup of the move, which will give him time to chunk up while the opponent is blocking, or even perform combos with wall crashes if he has chunks to spare already. Aganos can also combo into shadow Payload Assault using wall splat moves or beefy normals such as standing HK or close MP. If Aganos tries to make you block shadow Payload Assault, try to sneak in and throw him before the rocks come back down. You'll be forced to block the rocks after your throw completes, but you'll avoid excessive chip damage and limit Aganos's post-avalanche options. Because Aganos starts the match with two chunks, it's up to you to use them wisely before they get stripped from you. How they are used is often a matter of personal preference, and will change depending on the matchup as well; some characters struggle to approach an Aganos player who fires rocks as projectiles and quickly chunks back up during the fast recovery, while in other matchups, saving it for armor is very important. An Aganos with armor is powerful. Even though he has to respect his opponent's grounded heavy normals, he can interrupt or walk through moves other characters need to block, like many reversals or forward-traveling special moves such as Jago's Wind Kick. It also means he can do things like take an air hit on purpose, and then punish the landing frames of the opponent with good timing. This particular method of anti-airing is basically foolproof against single-hit air attacks, and is highly recommended. If you are low on chunks, rather than use Aganos' more easily breakable auto-doubles after landing a hit, consider doing a Pulverize or Natural Disaster linker directly after the opener and confirm whether the opponent is locked out. If so, continue the combo to build up more chunks, or else immediately end the combo with Payload Assault to gain a single chunk back. Being combo broken and gaining no chunks back will not doom Aganos, since combo breakers will send Aganos to a range where he is comfortable fighting, but it is definitely preferable to have at least one chunk at all times if you can manage it. If Aganos is not being pressured but is without chunks, he is still a competent fighter, especially considering his amazing footsies including standing MP and crouching HK, the latter of which can gain you a chunk on hit. The real struggle for Aganos will be if he is caught without chunks while being pressured from the air, since his large hitbox will leave him vulnerable to a lot of shenanigans. Your options include +LP for fast coverage that additionally destroys projectiles, shadow Natural Disaster (hold) to hit someone and bounce them into a recapture, regular Natural Disaster to try to slip away or hit the underside of a jumping opponent, or else play patient defense and block in order to gain a bar for some form of shadow move escape. Shadow Ruin is an option, but is difficult to use a close-range reversal, so you may consider trying to use a shadow counter instead. Patient, thoughtful play is heavily rewarded with this character, and regardless of Aganos' struggles when left armorless, the pure joy of punching someone through numerous walls will keep you coming back to this lovable giant. Show me an undead protector.